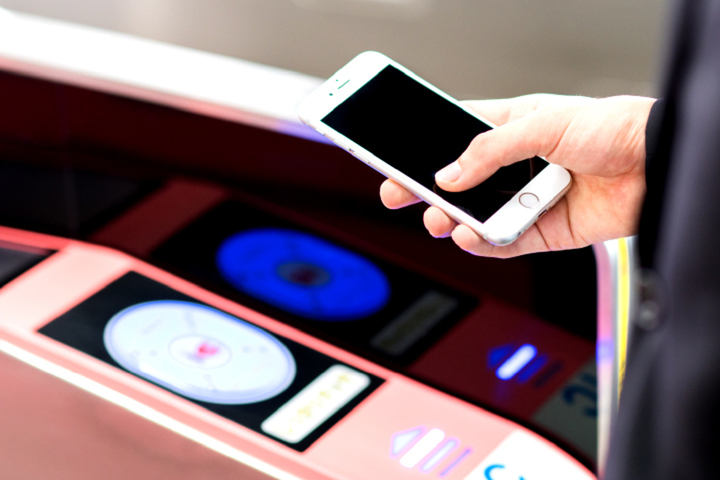 NFC technology (Near Field Communication) is used in many situations, such as payment of mobile wallet and electronic money. Conventionally, the parts of "NFC antenna" required for this communication had limitations in the range of introduction due to size reasons. 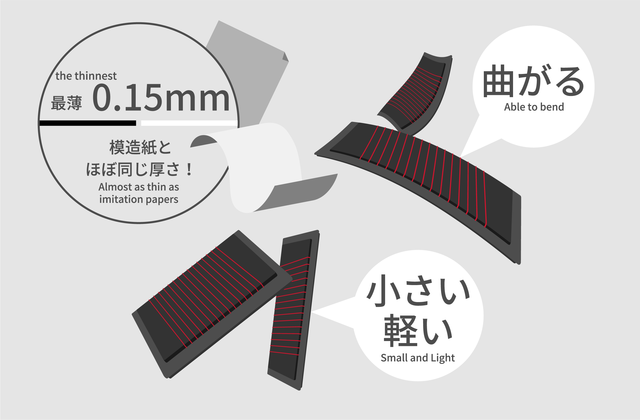 Therefore, RICOH developed "RICOH Spiral Antenna" with the characteristic of being delicate, thin, and able to bend. The change has made previously difficult ideas possible. 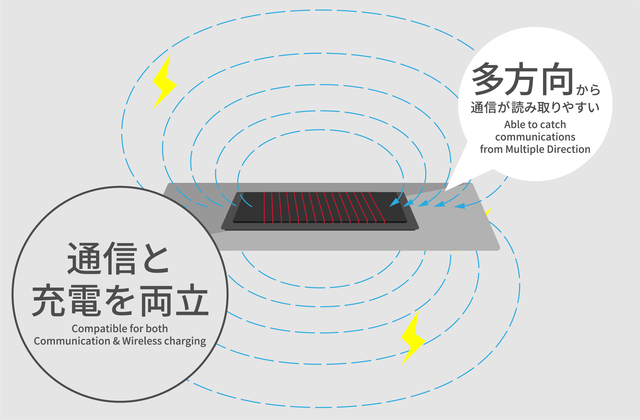 What's better, the technology can be utilized for wireless charge not only communication, it may be able to reduce the charging stress of various items. 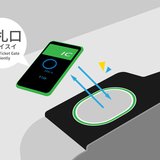 In short, NFC (Near Field Communication: Near Field Communication Standard) is a standard for "holding communication". When devices with IC chips of this communication standard are brought close to within 10 cm, both sides can recognize and exchange information, functions such as mobile wallet, exchanging data between devices, personal authentication, etc. It is a technology supporting various situations in our daily life. NFC is a mechanism in which "module" holding data with IC chip embedded and external terminals called "reader / writer" communicate data via "NFC antenna" included in each. 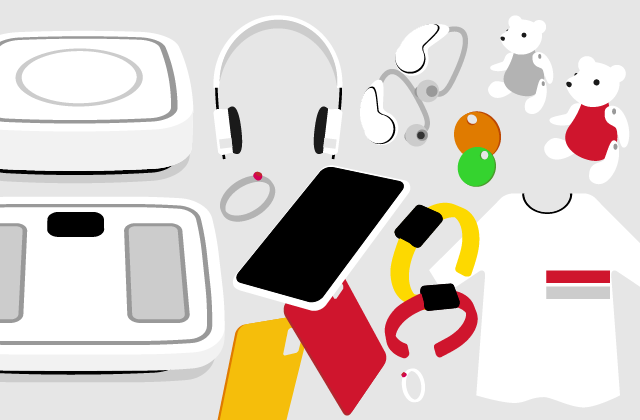 Various communication made possible with NFC device. However, the NFC antenna, which is the key component of this NFC technology, had the following problems and the subjects to be introduced were restricted. 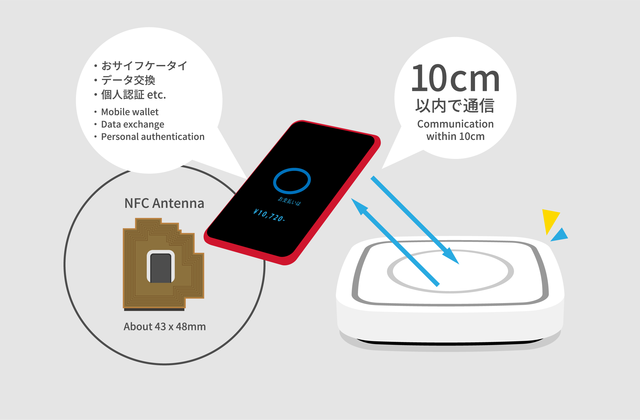 Therefore, Ricoh's research team worked on this subject and created a new "NFC antenna" called "RICOH Spiral Antenna" which is the providing technology of this time. In the conventional "NFC antenna", due to the influence of the internal metallic parts etc., there was a case that an event that radio waves were hard to read from a certain direction. On the other hand, "RICOH Spiral Antenna" is resistant to metal disturbance due to its magnetic field characteristics, making it easier to read communication from multiple directions, and it is expected to be used in a wider range of scenes. 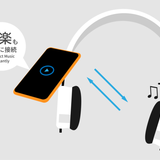 For example, when adding both functions of "mobile wallet" and "wireless charging" to a ring-shaped device, each antenna must be incorporated so far, securing a space within a small enclosure becomes a major issue when designing this 2-funtioned product. 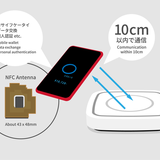 "RICOH Spiral Antenna" can be used not only for NFC communication but also for "wireless charging antenna" and can also benefit from space saving within a small enclosure such as a ring type device, for example. However, there is a limit to the charging ability of the small "RICOH Spiral Antenna". For example, charging the newest model smartphone may take several days. Please contact us if you have a concrete product image in mind, we welcome any of your creative ideas/proposals. This time, by utilizing this technology, from "product concept" of "what kind of customer", "what kind of needs" and "how to satisfy" to "product design" such as shape / color and package, we are looking for a TOTAL, COMPLETE product planning proposal! * If the design work is difficult, suggestions of only "product concept" are also acceptable. About the design proposal competition! The deadline for the product planning (concept · design) is January 31, 2019. 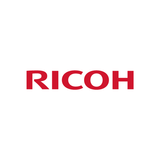 We will hold a briefing session on RICOH's technology, expect detailed explanation from RICOH's researchers on Wednesday, December 12 at 18:30 in Shibuya. We are looking forward to your active questions. Participation application from here (transition to external website). If you have any other questions, please feel free to ask in the chat box below. We are waiting for your active participation, from the bottom of our heart! ※ "おサイフケータイ®" mobile wallet is a registered trademark of NTT DoCoMo, Inc. Questions received from the attendants at the briefing session held on December 12 and January 8 have been answered by RICOH Corporation as below. Please definitely take these into consideration with your design! Q1: Can you create a system that knows location information when placing many readers side by side? A: Yes, it is possible. For example, there is an IC tag at the position of the reader captured when the reader is placed at 20 cm interval. Conversely, if there are a lot of tags, you can change the ID of the tag and you can know which tag is located when the reader moves. Q2: Will the product be out in China and the United States too? A: If it's patented by Ricoh Co., Ltd..
Q3: To what degree it has to be in order to form a business? A: Depending on how much you aim for, I think that if you can develop what you can sell for about 1000 yen or more - it will become a business enough. Q4: Does it interfere with microwave ovens? A: "There is no particular worry. The frequency is low, 13 megahertz." Q5: Is there a negative factor in terms of health by wearing? Q6: How cheap can the cost of the antenna be? A: The price is decided by magnetic material and IC chip. The price of the magnetic material is difficult to lower, but it becomes cheap if it is an IC tag. Although it depends on size and quantity, no matter how cheap it will still be around 30 yen ~ 50 yen at the moment. A: It seems to be tough in terms of cost. Since IC tags are used even in clothes and the like, the price tends to gradually decrease, but it is the present situation that it can not win against paper such as barcode. Q8: Is there any technology that can be printed and developed? Is it possible to eventually burn and dispose of it? A: "It is under development at this stage. It seems that it is difficult to burn the magnetic material as it is at the present stage." Q9: How is the durability of the band type? Also, is it possible to keep wearing it? A: It might break and therefore the band design is not suggested. As a result of repeated tests, there is no problem in terms of reliability including breaks. There is no problem with keeping wearing it, but the stress when wearing is more of a severe problem. Q10: Is there an antenna limitation? Q11: When incorporating it into a cube-like object, how much does detection and sensitivity change depending on the orientation? A: Depending on the size of the antenna, it is possible that it can be detected only in the direction where communication distance can not be obtained if it is small. Conversely it is possible to detect only the orientation. Q12: How much humidity or temperature is possible? A: "It is tested from 0 degree to 85 degrees and there is no problem in terms of reliability. In addition, there is no problem even in the environment of general use and countries of high humidity." Q13: I think that it is possible to write data to the IC chip, but can it be rewritten by the user him / herself if it is made into a ring or a smart band? A: It is possible depending on the specification of the IC tag. Q14: Is it possible to personalize and embed its own unique ID? A: It is possible, but trying to make a large amount is tough as there is no factory line. Q15: What is the capacity of the data? A: It is decided by IC tag, it seems to be about several kilobytes. Q16: How do you write and exchange data with smartphone etc. as if you put data in band type? A: Basically, I think that it will be usage to read pre-written data in IC tag, but it is possible to rewrite smartphone etc. as reader / writer. I think that passing sensor acquisition data via RFID communication is possible depending on the function of the IC. Q17: Is it possible to send data that has flowed to a different reader as data enters the IC chip wirelessly? "It is possible to write the written data to a different reader. (Example: You can write it with smartphone and load it with smart watch)"
Q18: Is the coil wrapped around the IC chip itself attached to the reader? A: No, it is an antenna with a coil wrapped around a magnetic material size of 5 × 7 mm. If you attach a tag chip there, it will be an IC tag, and if you attach a chip of a reader / writer it will become a reader / writer. Q19: I think that the reader / writer needs a power supply, what should I do in that case? A: There are a power supply and a reader / writer / writer IC in the reader / writer, and the antenna used there is Ricoh's, making it possible to reduce the size. Q20: If you move magnets, for example, instead of batteries to the reader / writer, the magnetic flux and does it occur and cause electricity? A: Although electricity may be generated, a modulation signal can not be sent. Q21: How high can we withstand pressure? A:Please let me check if there are concrete numerical values. There is no problem if it pushes a little. Q22: How about the weather like when you leave it outdoors? A: Depending on the outside environment, there is no problem if the temperature does not become too high. Q23: What is the communication speed? A: It is about several kbps. Q24: What is the cost of the antenna alone? A: "It will be around 50 yen to 100 yen. Tag IC or reader / writer IC will be charged separately." A: It depends on the creation of IC tag and reader / writer. I think whether security can be secured by reading / writing encrypted data with a reader / writer. Q26: When using a small antenna as a reader / writer, if there are multiple tags, can it be read accurately as data? A:Although it depends on the ability of the reader / writer, it is usually possible to read with multiple collisions even if there are multiple IC tags, but there is a limit. Q27: Is it possible to eliminate collision on programming by arranging multiple antennas? A: Depending on the anti-collision performance, it is difficult if different types of IC tags respond. Q28: Although it is 13 megahertz, I think whether it is possible to go far further without saying 10 cm proximity if raising the supply power, but how much is it? A: Although it is possible, since there is a law called Radio Law, I think that it is the current situation that it can only be done to not violate it. Q29: Are there any weakness? A: The first is water. If you put it in water, you must waterproof the antenna securely. And it is also affected by metal. Q30: Regarding temperature, is it safe for cold and warm? A: There is no particular problem with this. Q31: Have you ever thought about installing this to your Ricoh's copiers, etc.? A: Because it was acting as a target for external sales with a large production volume such as smartphones, we have not actively promoted to the inside of the company and it has not been adopted. I think that the reason is that there is no necessity of being small and that there was not a big difference in costs between buying it on its own and buying it outside. Q32: Please let us know about the dimensions of the antenna. A: It is the smallest, about 5 mm square. The thinness is about 0.2 mm. Q33: Although it is said that the coil winding itself is different from the existing loop antenna, what happens to the direction of the magnetic field when making contact with an existing reader / writer? If the distance is within a certain distance, what direction can it be? A: When the magnetic flux from the reader / writer passes through the coil of Tag, the current flows in Tag and communication is established, so communication can be performed by placing Tag in the magnetic field loop generated from the reader / writer. Q34: Is there a difference in communication speed etc. due to magnetic power? A: Time does not matter. If you leave a certain distance, you will not be able to communicate, and you can communicate if you get closer. The magnitude / strength of the magnetic flux is related to how far away it is. Q35: In the distance to be authenticated, is the information that can be read limited to a certain amount? A: There is no limit to the data, but it depends on the size of the memory installed on the tag chip side. Q36: Is there a maximum / minimum restriction on the size of the reader / writer? A: For example, ticket gates and the like are designed to communicate even 10 cm apart, and in settlement systems it is constrained to communicate even when 2-3 cm apart. Probably not too small as a reader / writer. However, if it is an individual's local system, if it sells as "to use in contact", it can not be made even with a small one. Q37: How much power can an antenna exchange? A: I think that it will depend on the size. Q38: Can reader / writer be used on anything? Where else can we find it? Q39: Is it possible to communicate or exchange power by bringing NFC antennas into contact with each other? A: It is possible. Replacing existing readers / writers and tags with this antenna is OK for everything, as it only makes the shape of the antenna "thin, thin, and bent". However, in order to achieve the same communication distance as the existing reader / writer, it must be the same size. There are possibilities that multiple works may be adopted. In that case, the prize money will be in the form of allocating 500,000 JPY. After adoption, we may ask you to participate in the subsequent commercialization project (optional). In that case we will pay 200,000 yen as a reward. Sales royalty will be paid according to the sales amount when it becomes commercialized by this competition. According to the agreement between TRINUS and the company / manufacturer responsible for commercialization, the amount of royalties may be changed without notice. Even when it is adopted in this competition, we do not promise to be commercialized for sure. As for the amount of royalties, up to 3 million yen per year, five years (15 million yen) will be the upper limit according to the terms and conditions of TRINUS. Please post all proposals in this site with images (JPG, PNG or GIF format). Proposal plan can be posted freely combining project plan, idea plan, idea sketch, rendering CG, drawing, photographs of actual prototypes produced. The total number of contributions is 6 files in total. Is not overly complex and can be manufactured and sold at a competitive/realistic price.